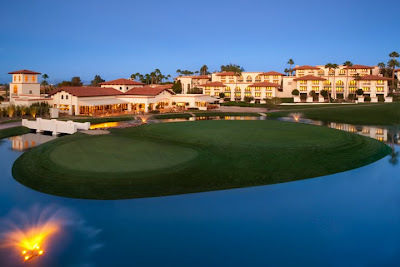 Golf Zoo's Blog: Scottsdale on a budget? Here's your deal!!! Scottsdale on a budget? Here's your deal!!! The Arizona Grand Peak Season Stay and Play. Every room is a "real" suite - Many hotels will call their rooms suites simply because they throw a couch and table in the corner. The Resort Suite at the AZ Grand is a true 2 room suite and over 500 square feet with a private patio as well. It's the real deal. It's all right there - with the Arizona Grand Golf Club on site, 3 restaurants, cool lobby bar with billiards, killer fitness club, spa, and less than 10 minutes from the airport, it's no fuss no muss. The Arizona Grand Golf Club - one of my favorites in Scottsdale, it's relatively tame (less than 6400 yards from the tips), but the layout is FUN. It's absolutely perfect for day of arrival or day of departure golf. Also - #18 is one of the best par 3's in Arizona. Arizona Grand Golf Club - Onsite at the resort - day of arrival after 1:00. Club West Golf Club - dramatic elevation changes - esp. on back nine - double green on par three 17th hole. There are also many other courses available, so just ask, and we can customize an itinerary for your group. This stay and play is valid now through the end of peak season, and will be even less after April 10th, 2011! $199 per person per day covers everything - double occupancy suite at the Arizona Grand Resort, the $30 daily resort fee, golf each day, and all the taxes. It's simply the best deal in Arizona for peak season this year. Call Chris Parcell at 888.867.6911 or Lori Greene at 888.867.6921 in our Phoenix / Scottsdale offices today! Reynolds Plantation- High end golf at it's best!